Peter Buttigieg announced his 2020 presidential campaign yesterday. 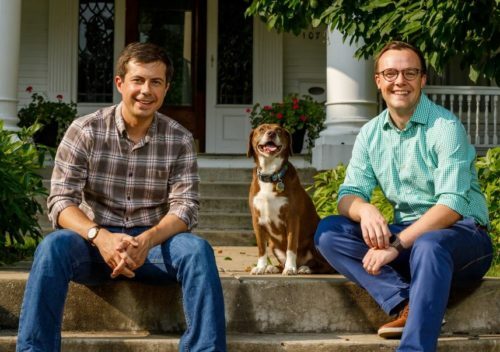 Buttigieg (pronounced BOOT-uh-judge) is currently the mayor of South Bend, Indiana, and he’s a gay man. In an email, he said that he is forming an exploratory committee for a 2020 presidential run. An exploratory committee is registered with the Federal Election Commission as a political campaign. “My generation is the generation that experienced school shootings beginning when I was in high school, the generation that fought in the post 9/11 wars, the first generation to have to deal with the reality of climate change, and the first generation not to be better off than our parents materially – if nothing changes,” he wrote in his announcement. Buttigieg is 37-years-old, making him one of the youngest candidates to enter the race, tied with Representative Tulsi Gabbard, who is also 37. He may be the first candidate to enter the race that hasn’t had to apologize for something in their past. “If you’re my age or younger, you were in high school when the school shootings became widespread, you’re going to be dealing with climate change for most of your adult life in specific, noticeable ways,” Buttigieg told The Atlantic. Buttigieg, who is a Rhodes Scholar, is married to his husband Chasten. Buttigieg joins several other candidates in the Democratic primary. Senator Kamala Harris (CA), Senator Elizabeth Warren (MA), Senator Kirsten Gillibrand (NY), Representative Tulsi Gabbard (HI), former Representative John Delaney (MD), former Housing and Urban Development Secretary Julian Castro, former West Virginia state senator Richard Ojeda, and tech entrepreneur Andrew Yang have already announced their campaigns, and more Democrats are expected to announce in the coming weeks.